Alexander Barclay’s Estate and Final Settlement, A Summary! Alexander Barclay died on 9 December, 1905 in Olmsted Co., Minnesota and his body was laid to rest in Farmington at the Corinthian Cemetery in Dakota County. Alexander’s tombstone is featured at Find A Grave. In recent past posts I have written about the heirs of Alexander. These siblings, nieces and nephews were found as a result of his death and the information found in his estate papers from Dakota County, Minnesota. Here is summary of the posts written about Alexander’s heirs. You can find these posts by using the archive box on the right side of this blog, or the search box. Grace Barclay McDonald as Administrator of Alexander’s estate, December 1, 2014. 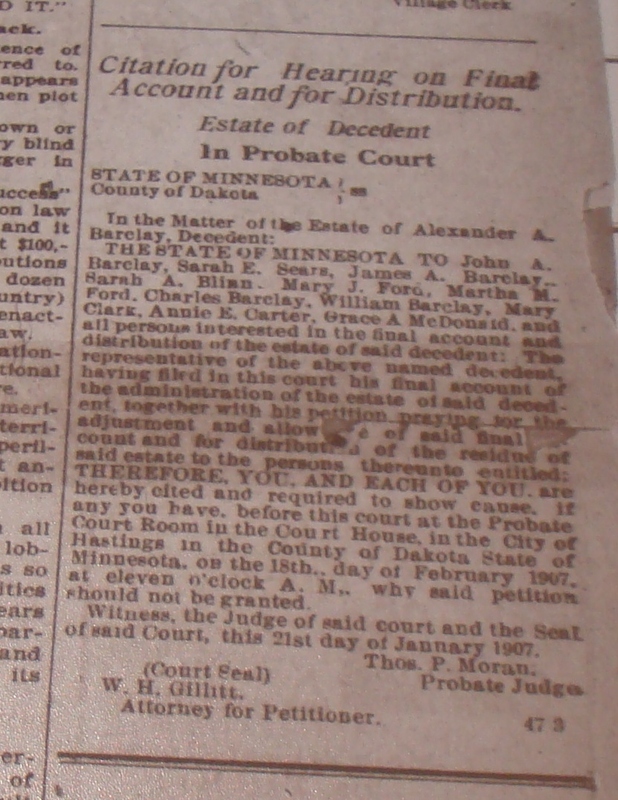 Alexander Barclay’s probate took from December 1906 to April of 1907. My grandmother Grace A. McDonald petitioned the court to start the process of the probate but she was unable to continue because she was pregnant at the time. A Dr. Rogers was assigned to be administrator of Alexander’s estate process. There was no will so the estate had to be probated. I refer you to the 2nd post in the list above for a review. 1. Petition for Administration of the estate and submitting of the heirs-at-law document. 2. Setting of a Bond and granting of Administration to H.N. Rogers. 3. Warrant to Appraisers and oath of the Appraisers. 4. Taking Inventory of the Estate which includes the personal possessions, land and other financials like stocks. 5. Petition for License to Sell Real Estate. 6. Publication of announcements in the local paper for the Creditors and hearing for claims against the estate and payment of those debts. Printer’s Affidavit. 7. 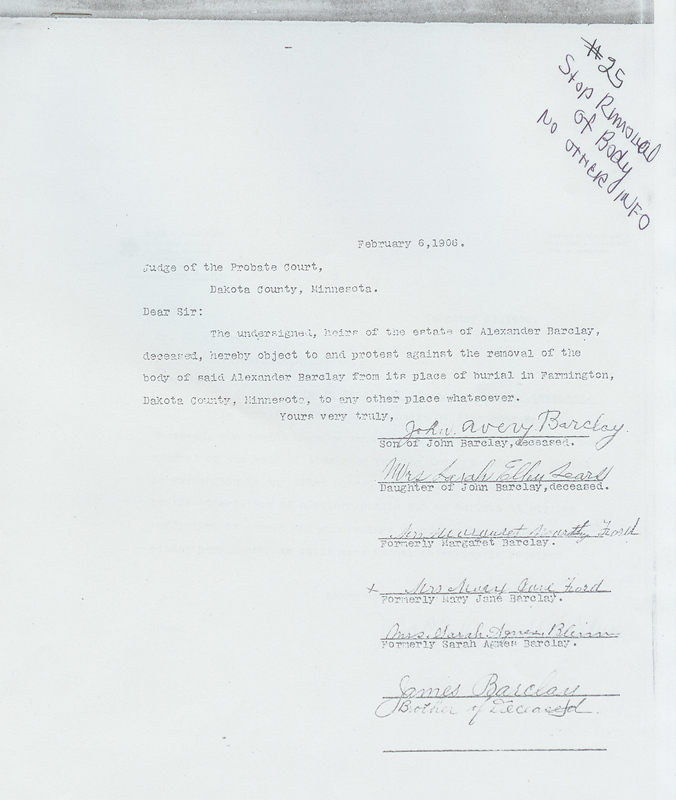 In this case, affidavits from the children of the older brother John Barclay who was believed to be deceased were obtained, along with affidavits from other family members. 8. Distribution of the stocks and transferring title to heirs. 9. Final accounting and Petition for Settlement of the Estate. 10. Order discharging the Representative and releasing of the surety bond. In the final account for Alexander Barclay’s estate eleven Receipt forms were filled out for each of the 11 heirs and signed by each one, so this means they had to be mailed, signed and returned. The siblings received approximately $548 plus 1/10 interest in the mining stocks. Grace Barclay McDonald also received the larger sum. For John Avery Barclay and Sarah Ellen Barclay they received about $273 plus 1/20 interest in the mining stocks. The probate of Alexander Barclay has been extremely helpful in identifying the two families of John Barclay. Unfortunately, it has not provided information about the origins of the Barclay family nor the mother Margaret of the first 7 children. Studying the siblings has created more questions and an uncertainty of the actual ages of the children and their birth order. John Barclay states he came to the United States in 1833 per his naturalization. After having studied the children of this man and learning of their viewpoints about the origins of the family, I think that a new approach is in order in searching for John Barclay’s origins. This brings to a close the postings on Alexander Barclay’s estate. It is not the close of research which will continue. In my opinion Alexander left a lasting legacy to his family. I do know that George Barclay, his brother and my great grandfather, along with Grace, his niece and my grandmother, held him in esteem. Alexander Barclay was buried in the Corinthians Cemetery in Farmington, Dakota County, Minnesota. Corinthian Cemetery shares the area with another cemetery St. Michael’s Catholic Cemetery. 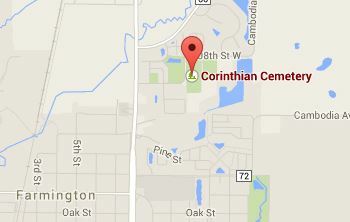 Corinthian Cemetery is not on the main street of Farmington. Alexander’s tombstone is under my maintenance at Find A Grave after the original poster kindly transferred it to me. Here I am with the tombstone of my great great uncle Alexander Barclay. You can see the storm clouds forming in the background and I look very cold. We could not dally because the sky opened up. I am amazed at the size of the monument for Alexander but dismayed that there was no flag or indication of Alexander’s service in the Civil War. Something I will have to attend to. Any help would be appreciated just leave a comment. Alexander died 9 December 1905 but he was buried 17 December 1905. Something must have happened regarding the burial of Alexander’s body that required an affidavit to be prepared and signed by the heirs protesting the removal of Alexander’s body from Farmington? There were no other documents in the probate packet but there might be documents in the court clerk books at the courthouse? Yes, we have a mystery. The Death of George’s Brother Alexander Barclay! About a month before the birth of Miriam to Grace and Ronald McDonald of International Falls, Alexander Barclay passed away. He was a brother of George Barclay. I have featured Alexander on this blog many times. He has been very important to the research on the Barclays. In some posts I just mention Alexander as way to link him to the other family members. Here is a list of posts about Alexander Barclay: You can use the Archives box or just put his name into the search engine box on the right. The Murder Investigation regarding the Death of George A. Barclay? Dec 16, 2013. After the Death of John Barclay his wife Ellen lives another 10 years! August 8, 2013. John Barclay December 1897, George’s Father succumbs! July 11, 2013. 1895 State Census – The Barclays, February 7, 2013. George Barclay On His Own: A Trading Post! September 21, 2010. John Barclay’s Land! September 11, 2010. The Naturalizaton of John Barclay, August 26, 2010. John Barclay Joins the Fight! August 7, 2010. According to my records, Alexander died on the 9th of December 1905. 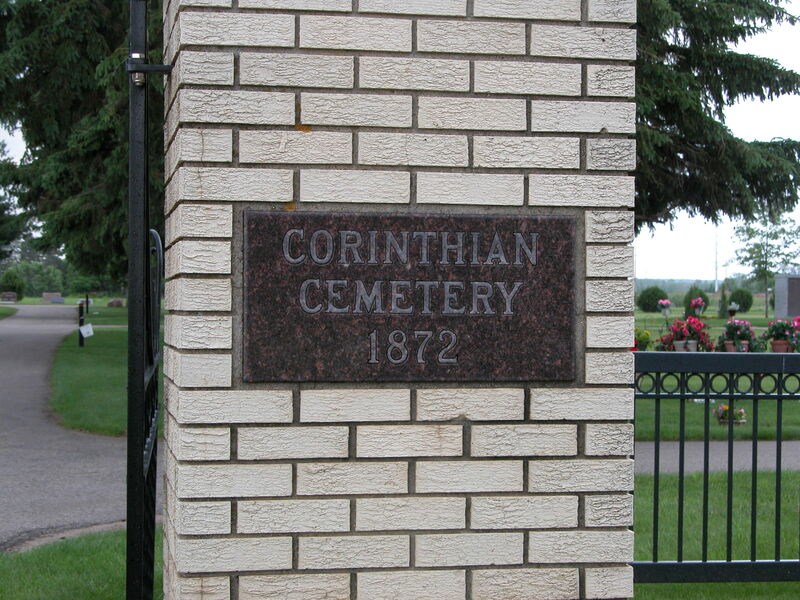 He was buried in the Corinthian Cemetery in Farmington, Dakota Co., Minnesota. 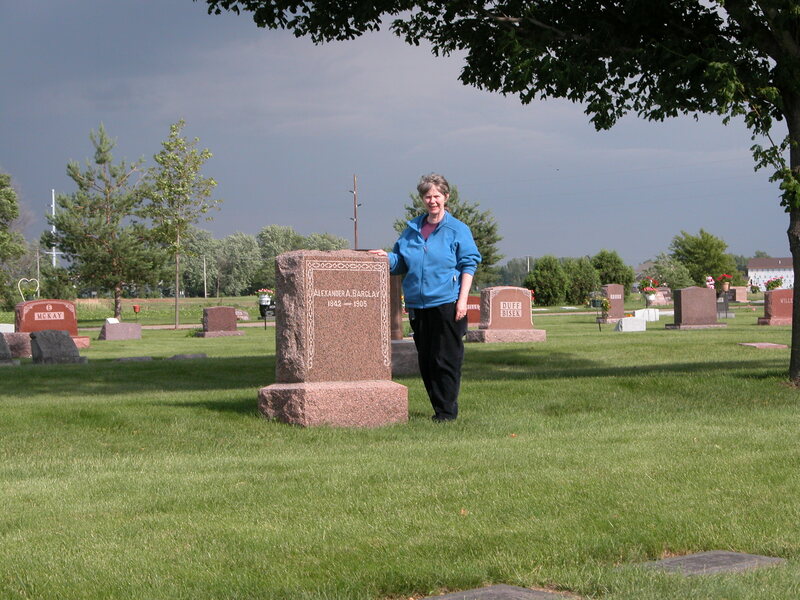 I visited this cemetery in 2007. 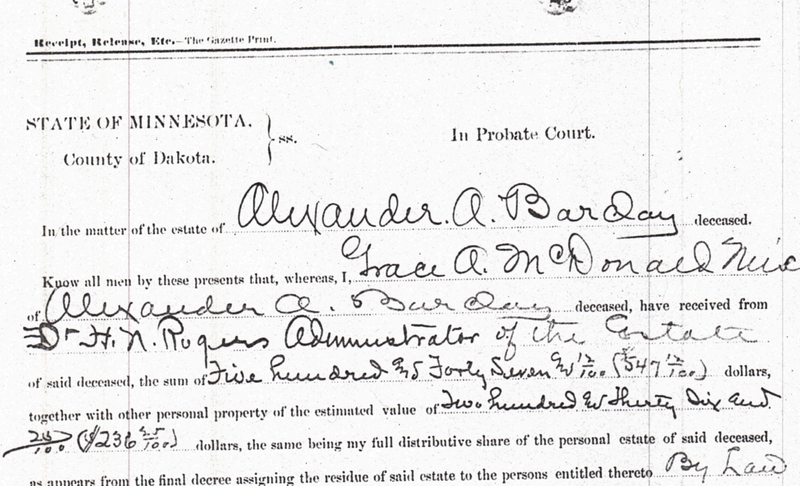 I had all sorts of trouble finding Alexander’s death date because he was not appearing in Dakota County, Minnesota. It turns out his death was not easy and he died in the Hospital for the Insane in Rochester, Olmsted County, Minnesota. Rochester Patient Registers: #7127, 80, Alexander Barclay, Admitted Nov. 5, 1905, from Dakota Co., 63 years, single, religion: none, ____ , born in Conn. Hartford, ill health, unknown, sen. dem., no. of attackes 1, no. of admittances 1, age 62, 9 mos., 9 mos. 24 days, time in hospital 24 days, Died Dec 5, 1905, ex. sen. dem. #114.6.1.5B Box 1 Vol. A & B., pg. 179. Rochester State Hospital Adm. & Discharge: #243 Alexander Barclay, Residence: Farmington, Dakota Co., Admitted Nov. 15, 1905, Died Dec. 9, 1905 114.B.9.7B Box 1 1879-1955. 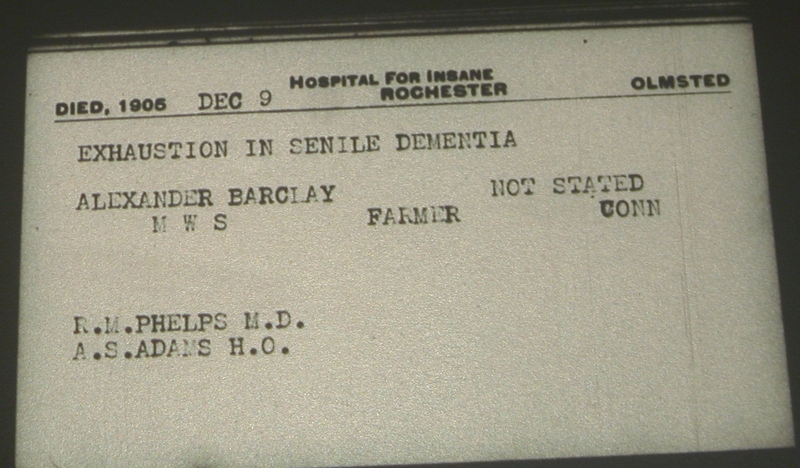 Obituary Record – Rochester State Hospital – Line 9, 1905, Dec. 9, Alexander Barclay, Male, age 63 Single, Farmer, born Conn., Came from Dakota Co., Disease is unreadable. No. of attacks 1, No. of admissions 1, Case #7140. Admitted 1905 Dec. 8. In residence 7 days, total duration of disease 1 year 7 days. Cause of Death Ex in Sen Dem. Remains removed. Minnesota Death Certificates – Died 1905, Dec 9, Rochester, Olmsted Co., Minn. Exhaustion in Senile Dementia, Alexander Barclay, not stated, MWS, Farmer, Conn. R.M. Phelps M.D., A.S. Adams H.O. I discovered the end of his life by accident. 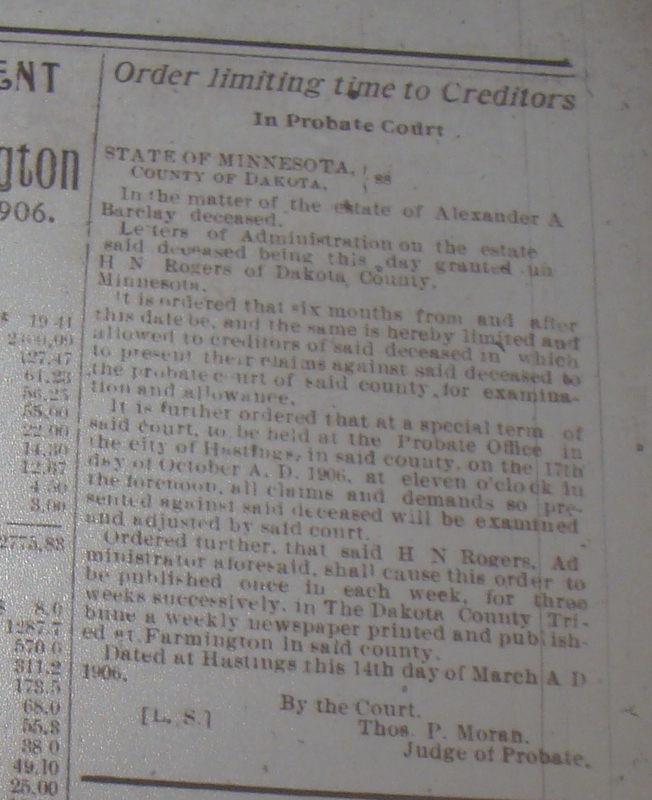 I was working diligently at the Minnesota Historical Society on their newspaper collection and in the pages of the Dakota County Newspaper I found entries in the published town finances for Farmington under County Finances, Dakota County Disbursements. There were two entries in this listing of the county finances regarding Alexander. There was also an article about court proceedings which committed Alexander to the hospital in Rochester. City Expenses: pg. 2, 4 col. Insane Expense, #1581, W. H. Brownell # 50 o Court #1582. City Expenses: Dr. J. C. Fitch $7.50 Dr. H. N. Rogers examination $7.50 for A. Barclay, $8.49. Adjudged Insane: Alexander Barclay; of Farmington, was adjudged insane by Judge T.P. Moran on Tuesday evening, and committed to the hospital at Rochester. He was formerly a resident of Lakeville, and is sixty-three years of age. He was taken there by Deputy A.C. Nesbitt and W.W. Carmon Wednesday. Back then any sickness including old age was turned over to the state hospital and it was not till about 1950 and beyond that we started to see these different symptoms of aging in a different light such as dementia. Since Alexander was single and there was no family to care for him nearby the town and county took action. Unfortunately, this condition is part of my family medical history. 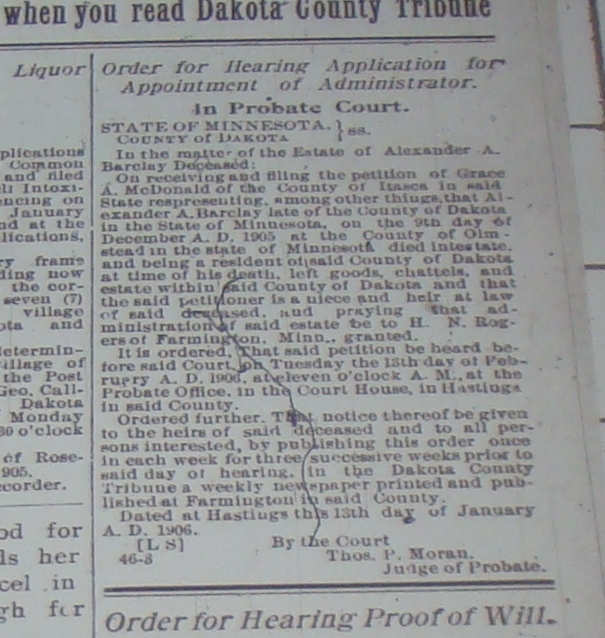 Fortunately, several obituary notices were found with the help of the Dakota County Historical Society, which give a little more information about his life. Obituary notice in the Hastings Gazette, Saturday 23 December 1905. 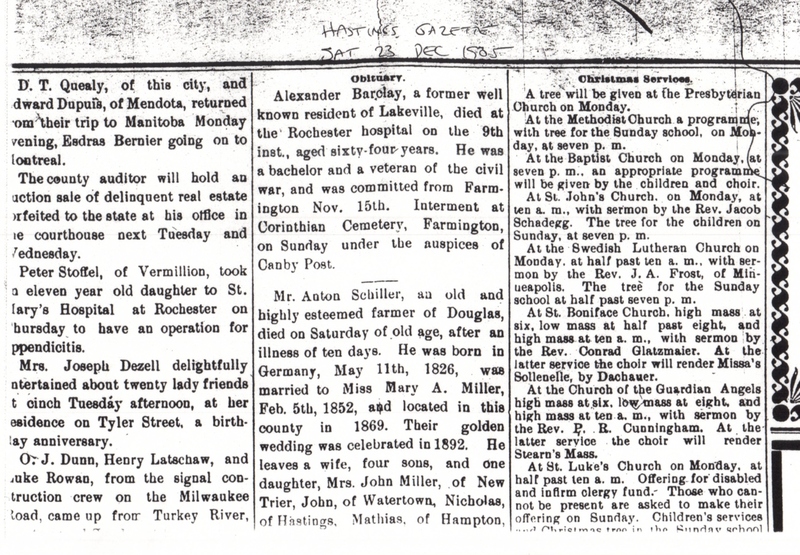 Obituary notice in the Dakota County Tribune, Friday 22 December 1905. “Death of Alex Barclay, Alex Barclay formally of Farmington died on Dec 9th at Rochester. His body was brought to Farmington where he was buried Sunday Dec 17th. The last obituary is very well done except for the description of Alexander’s family. There were eleven (11) heirs two of which were children of his oldest brother John Avery Barclay. The family of Alexander, rallied and had his body shipped back to Farmington where he had made his home since 1870. Alexander does appear in the records of the Canby Post GAR (Grand Army of the Republic) No. 47. The only regret I have is there is no picture of Alexander. It is now time to catch up with Alexander Barclay. After the 1870 U.S. Federal Census, George left for Brainerd and then headed to Pine River leaving his brother Alexander Barclay behind in Dakota County, Minnesota. It would be interesting to know the reasons these two brothers went their separate ways. I do know they kept in touch. 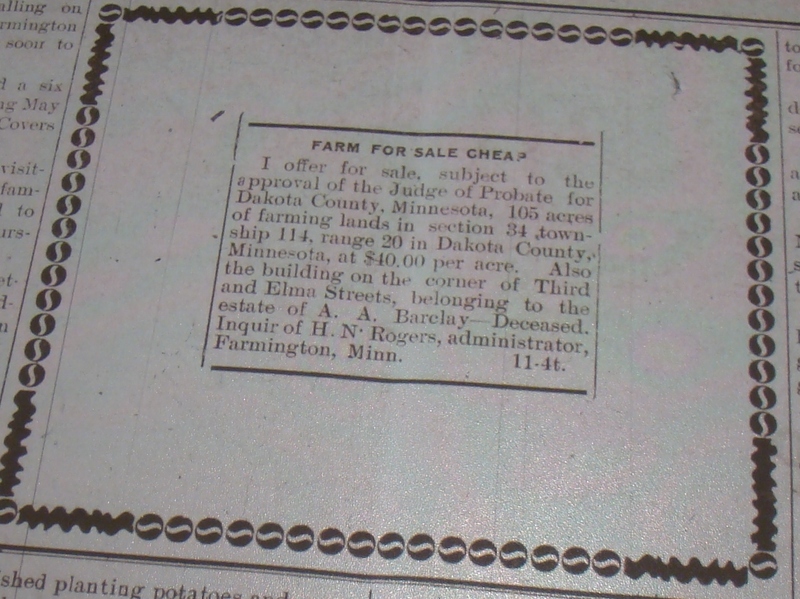 In the post dated August 19, 2010 “After the Civil War- George and Alexander Try Farming?” I describe the 1870 U.S. Federal census and the 1875 Minnesota State Census. In these census Alex is living alone or rather in a separate household, yet he is next to the Giles family. George Barclay his brother is not listed as we have noted before. 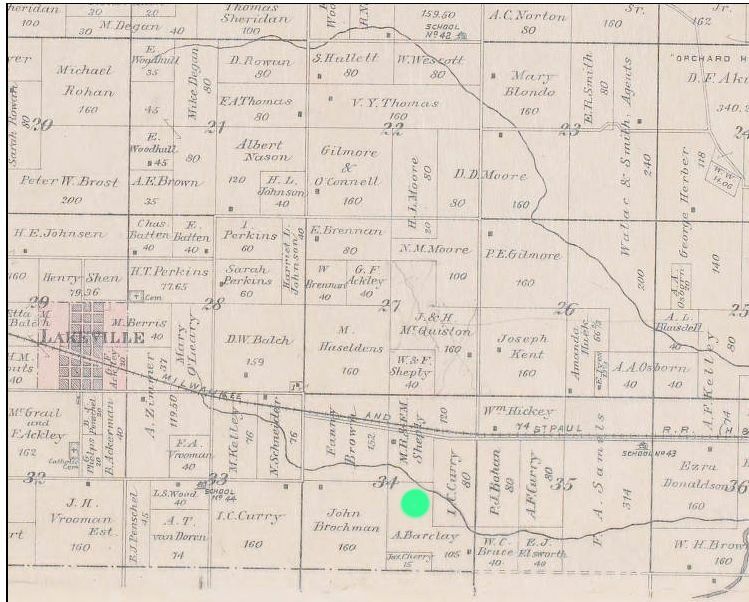 Alex is in Eureka Twp., Dakota County, Minnesota in the 1880 U.S. Federal Census and the Giles family are included under his household listing? I think R.J. should be R.I. for Rhode Island? Line 4, 157, 267 Barclay, A.A., male, 40 years old, born in Connecticut, parents both born in Scotland, occupation farmer, single. Line 5, 208, Giles, Francey, W, F, 50, widowed, keeping house, born Mass, parents born Mass. Giles, Lorence, W, M, 14, son, single, farm laborer, born Minn, father born [R.J.] , mother born Mass. Line 8, 158, 209, Giles, [Leonza] w, m, 31, married, farmer, born R.J., father born R.J., mother R.J. , Giles, mary, w, f, 26, wife, married keeping house, born [Canada], parents born Ireland. Giles, Hattie, w, f, 7, daughter, born Minn. Giles, Edward, w, m, 5, son, born Minn. Giles, Sarah, w, f, 2, daughter, born Minn. Giles, George, w, m, 2/12, son born Minn. Giles, Henry, w, m, 22, brother, farm laborer, born Minn. Source: 1880 U.S. Federal Census, Eureka, Dakota Co., Minnesota, pg. 18, SD 2, ED 801, enumerated on June 22, 1880. Ancestry.com. According to the Minnesota Cemetery Inscriptions Index at Ancestry.com a David D. Giles died on 25 July 1879 and is buried in Corinthian Cemetery. He was 59 yrs. old, 6 mos and 5 das. His spouse was Fannie Anderson Giles. He is in the SW section of the cemetery. 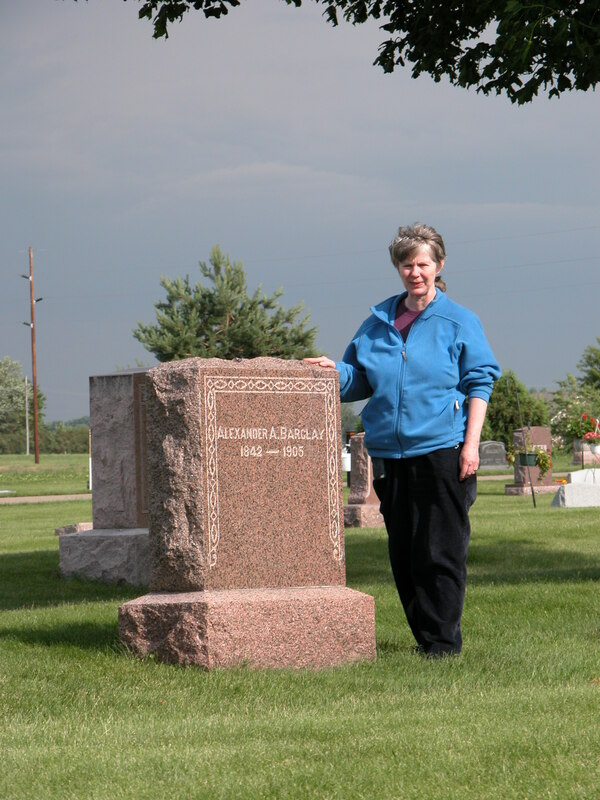 I have been to this cemetery and it is in Farmington, Dakota County, MN. What the relationship is between Alexander and the Giles family is still a bit of a mystery and if Fannie’s maiden name is Anderson, I am now more puzzled? 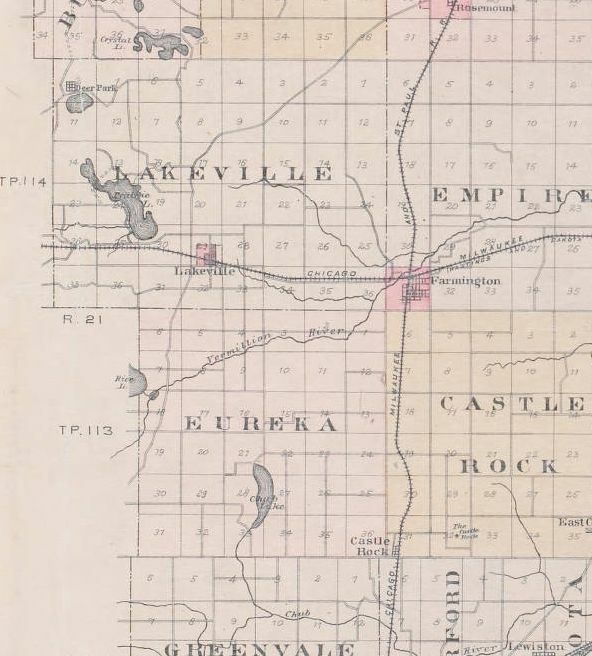 The interesting fact is that if you fast forward to 1896 Alexander was living in Lakeville Township not Eureka Township which indicates perhaps the boundaries changed? I have not had the opportunity to do deed research on Alexander. 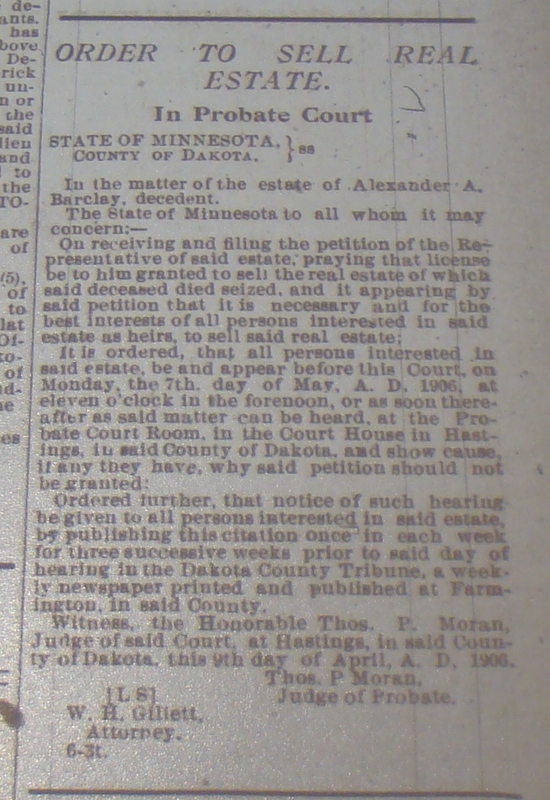 The Family History Library has very little on land records for Dakota County, Minnesota and Minnesota as a whole. So I guess that means another trip to Minnesota? The location is section 34 in Lakeville to the south and east right on the border of the two townships of Lakeville and Eureka. John Barclay had two families. He was first married to Margaret. When he married Margaret is not known and where she is buried is also unknown. She probably died in Connecticut but so far a search of records reveal only one possibility of a Margaret Barclay dying in Enfield in 1848 of about the right age. My great-uncle Alexander Barclay has been very good to me. I secured his probate file at some expense from the Dakota County Courthouse in Minnesota and it opened up a very big genealogical door! From this first marriage came seven (7) siblings that were listed in Alexander’s estate file. There wasn’t a will so some of the information is carefully taken from the probate file. Other information such as census searches and indexes were also used. I am slowly gathering the facts together on the siblings and will present more at a later time. 1. John Avery Barclay II born 23 July 1867 in Sibley Co., Minnesota and died 8 March 1951 in Seattle, King Co., Washington. 2. Sarah Ellen born 29 March 1869 in Sibley Co., Minnesota. 3 and 4. There were two other children twins: Albert and Alice born 1870 Silbey Co., Minnesota but it is looking like they didn’t survive. Some of this information was supplied by another cousin. 2. James A. Barclay born about 1838 in Connecticut, he died about 1906 in Bridgeport, Fairfield Co., Connecticut during the probate process of Alexander’s estate. He married a Maryanne Stewart and had children. 3. Sarah Agnes Barclay born about 1840 in Connecticut. She married Porter Blinn about 1860 in Connecticut. He was born about 1842 in Connecticut. They had 6 children and it looks like they stayed in Newington, Hartford Co. , Connecticut. Update: May 26, 2010 – I was at the Family History Library researching when I discovered that the Sarah that I thought was Sarah Agnes Barclay in the census married to Porter Blinn was the Sarah I should be studying for the Barclay’s. Turns out she is a Griswold and her father is Henry Griswold. So back to the drawing board on #3. This is why it is so important to check other sources like marriages and birth records and not totally trust the census. 4. Mary J. Barclay born about 1841 in Connecticut and died 28 March 1917 in Bristol, Hartford Co., Connecticut. I have her estate file. She married a Jerome B. Ford and had 3 daughters. Jerome was born about 1846 in Connecticut. 5. Alexander A. Barclay was born September 1842 in Hartford, Connecticut and died on 9 December 1905 at the Rochester Hospital for the Insane in Olmsted Co., Minnesota. He apparently suffered in the end with dementia. He was only in the hospital about 6 days before he died. He was buried 17 December 1905 in the Corinithian Cemetery in Farmington, Dakota Co., Minnesota. 6. Martha M. Barclay born about 1843 in Connecticut and died around 1920 or later in California. She married a Jeremiah Ford in about 1859 in Connecticut. I do not know if Jeremiah and Jerome were brothers. Martha and Jeremiah had two daughters. 7. George Angus Barclay was born 18 August 1844 probably in Connecticut and died on the 28th of October 1898 in Pine River, Cass Co., Minnesota. George is the subject of our blog and more information will be forthcoming on his life. He married Amarilla Spracklin in 1878 and they had 2 children. The second marriage of John Barclay was to Helen in Scott Co., Minnesota. I have not been able to find their marriage in Minnesota records but it happened prior to 1860 per the census and from this marriage their were four (4) children born. 8. Charles Barclay was born about January 1860 in Eagle Creek (Shakopee), Scott Co., Minnesota. After the death of his mother in 1907 he seems to have moved from Shakopee and might have gone to Minneapolis and died about 1938. Charles didn’t marry as far as I can determine from census and other documents. 9. William Barclay was born about 1863 in Eagle Creek (Shakopee), Scott Co., Minnesota and died 7 Dec 1937 in Gallatin Co., Montana. He married a Clara E, probably in Minnesota. She was born about 1859 in Wisconsin and died about 21 March 1919 in Madison Co., Montana. They had one child name Foster born 1891 and probably died by 1907. 10. Mary E. Barclay was born about 1864 in Eagle Creek (Shakopee), Scott Co., Minnesota and died 19 February 1930 in Cascade Co., Montana. She married Charles B. Clark probably in Minnesota for he was born there about 1856. He died 28 February 1932 in Deer Lodge Co., Montana. They had at least one child named Ruth Clark who was born about 1895. It is interesting that there are two Mary’s named in John’s family a good 20+ years apart. 11. Anna Elizabeth Barclay was born 15 April 1870 in Shakopee, Scott Co., Minnesota and died 4 August 1955 in Menominee, Menominee Co., Michigan. She married David Maurice Carter on 9 July 1885 in Eagle Creek (Shakopee), Scott Co., Minnesota. David was born 9 January 1860, Marinette, Marinette Co., Wisconsin. The information for this family was supplied by a cousin and has not been verified. Anna had 4 children. The person that initiated the probate process for Alexander was his niece, my grandmother Grace A. Barclay McDonald. She was pregnant at the time and lived in International Falls. She was unable to attend the court sessions because she had the baby and was “indisposed.” The baby was my Aunt Miriam. Book: Logsleds to Snowmobile’s, Pine River Centennial Celebration, 1873-1973, Written by the Citizens of Pine River and edited by Norman F. Clarke, Pine River Centennial Committee, 1979. A copy is available at the Family History Library.